When trying to make a change, there’s nothing easier than signing a petition. You don’t have to get up from your couch and signing takes up five minutes at most (if you type reeeally slowly). In the following weeks I want to show you some campaigns that are worth supporting (in my opinion). I really hope you decide to go ahead and sign. Here we go! The first campaign is by the Christian help-organisation Micah Challenge. It’s a world-wide campaign with the goal to halve poverty by 2015. Quite ambitious right? Well, one way they are trying to achieve this is by starting a petition to make Ferrero, the corporation that manufactures Nutella or Kinder Riegel for example, put the Fair Trade sign on their products. Currently, Ferrero is benefitting from extremely low cocoa and hazelnut prices that don’t allow the farmers to escape the poverty trap. Child labour and even child slavery is more common than we want to admit while eating a toast with nutella. Well, not only the media knows about that fact, also Ferrero itself. It’s actually working on getting all their products certificated by 2020. So why put up a petition against them? Well, there’s a trap, they won’t be getting the independent Fair Trade certificate. Only the Fair Trade certificate assures that the standards are adhered to to tackle the problem of poverty. 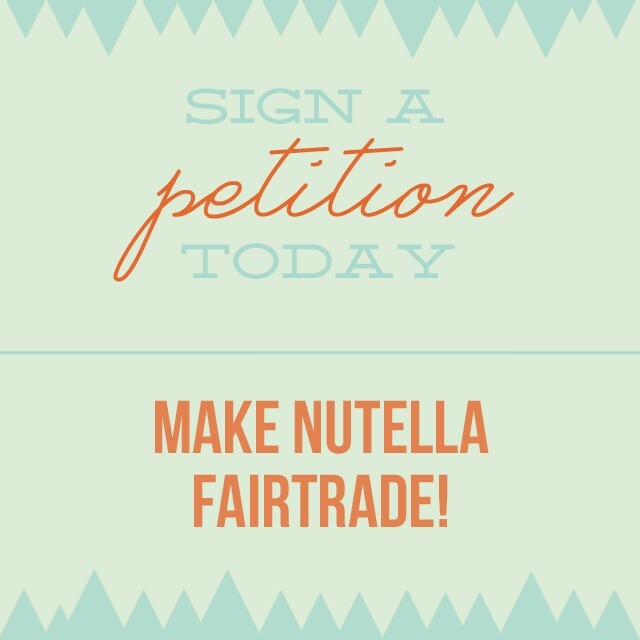 That’s what the petition is for – to get Ferrero to comply the standards of the Fair Trade certificate. For more information (in German) and to sign the petition go here. You’re looking for more easy ways to make a change? I’ve got some ideas! What about using some natural soap or installing aVoid on your browser! Enjoy reading.